Picture the future when we’re greeted upon walking into stores with tailored offers sent to our phones. The future of retail is coming and I’m excited by the opportunities this provides to retailers and entertainment venues. Proximity marketing broadcasts messages to Smartphone Apps using Wi-Fi and Beacon sensors. Beacons have become the preferred technology with Apple investing in the technology with its iBeacons software. Beacons send messages to Bluetooth Low Energy enabled devices, including iPhone 4s and later, iPad 3rd Gen and Android 4.3 (Jelly Bean). The small wireless Beacon sensors have a range of 30 metres. Apple’s iOS7 operating system has the Beacons built into the phone meaning it can transmit and receive. It’s predicated that Beacons will supersede the clunky QR codes. Major League Baseball was one of the early adopters of this technology. They’ve used the technology to enhance the fan experience at stadiums. 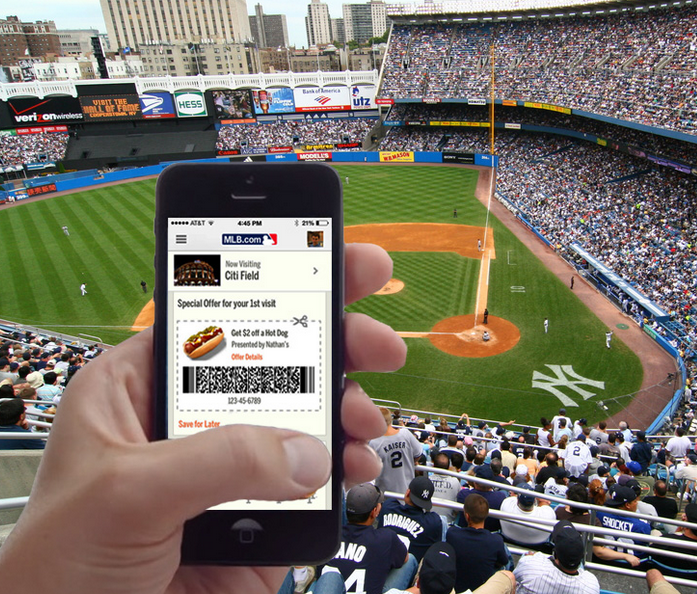 Fans can check-in to receive offers and locate their seats quicker. No more waiting in queues to get food and beer as it can be ordered and delivered straight to their seats via the App. In retail environments, Beacons can offer retailers big opportunities to improve the customer experience. Marketers are always trying to personalise the shopping experience for their consumers. By making consumers feel more special, they’re more likely to spend more money. Beacons can be used in many retail scenarios from location based offers to loyalty programs. Customers can save money with discount coupons sent to their phones as they walk past products in-store. With loyalty programs shoppers can earn points every time they enter the store. By making their store maps interactive, customers can save time by pinpointing products in-store. Paypal has ecommerce covered with its Beacons that allow users to authorise payment via their mobiles. Museums and art galleries are using the technology to improve the experience. In January I visited Hobart’s award winning Art gallery MONA, and was given an iPod and headphones. The iPod was part of the virtual tour and helped us discover interesting things about the exhibitions. At the time I wasn’t aware it was using iBeacons. At a recent Mobile Monday presentation on iBeacons it was discussed phones in the future will be able to detect Beacons and turn on Bluetooth which will be a great advancement. With more and more of our lives conducted via our mobile phones, Beacons will provide businesses with some exciting possibilities.